Ambulances parked up in Waterloo. The NHS in the capital is suffering huge pressure on its A&E departments at the moment. Photo by psyxjaw via the Londonist Flickr pool. Croydon University Hospital has declared an "internal major incident" due to severe pressure on its A&E department, the Croydon Guardian reports. It is believed the hospital admitted more patients than it had available beds. It's important to remember that declaring such an incident doesn't mean there's a disaster — it gives hospital bosses powers to bring in extra staff, allowing them to open up more beds to cope with demand. It also means ambulances will be asked to transport patients elsewhere. The news comes as pressure on A&E departments across the capital reaches a crescendo. 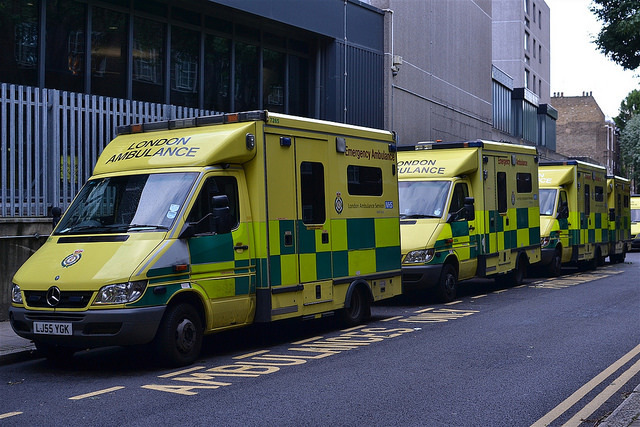 The most recently-published waiting time figures show that for the week ending 28 December, 15 of London's 19 NHS Trusts missed the target to see 95% of A&E patients in four hours. London Northwest NHS Trust, which runs Northwick Park and Ealing Hospitals, only saw 63.9% of A&E admissions within the target time. This is a period of peak demand for A&E services as the cold weather and high levels of flu and norovirus bring extremely high numbers of patients to hospitals. Add to that closed and overbooked GP surgeries resulting in people turning up at emergency departments seeking treatment for minor ailments. As we reported in November, the capital's A&E departments are already struggling to cope with demand. Problems build up when people who shouldn't be present at A&E turn up expecting treatment while, at the same time, there is difficulty freeing up beds at Christmas. This excellent piece from The Telegraph gives a measured overview of the kind of pressure hospital staff are under at the moment. As many hospitals are urging: don't go to A&E unless it's a real emergency.